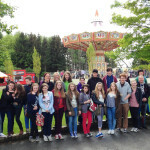 Holy Nativity took a trip to The Big Night Out at Lightwater Valley. One of the group has written about the afternoon. 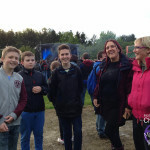 On Saturday 10th May, 13 teenagers set off to Light Water Valley with Robb, Ruth and Michelle on a coach with groups of other teenagers from other churches to participate in the big night out – a chance for young Christians to get together and have fun. When we arrived at Light Water Valley the weather was fine but as it turns out – not for long! We had 3 of the four seasons: all but summer, however we didn’t let this spoil our fun on the rides. After the rides closed, we all met up on the water-logged field for entertainment, this was provided by two bands; the first, Daughters of Davis, and the second, The Gentlemen. 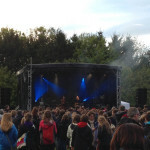 The Big Night Out is a great way of getting Young Christians together to have some fun. Phoebe enjoyed anything that was high and turned you upside down, I was not a huge fan of either of these but I still had fun. Everyone that went can’t wait to go again next year. Going to the Big Night Out has been great fun. We hope to look at increasing our work with Teenagers in the coming months.